As we enter the final week of the term, I would like to once again thank all of those that planned the 24-hour run. I know of one boy who liked it so much he told me he was upset that it was over. I am sure he will get his encore performance next year. 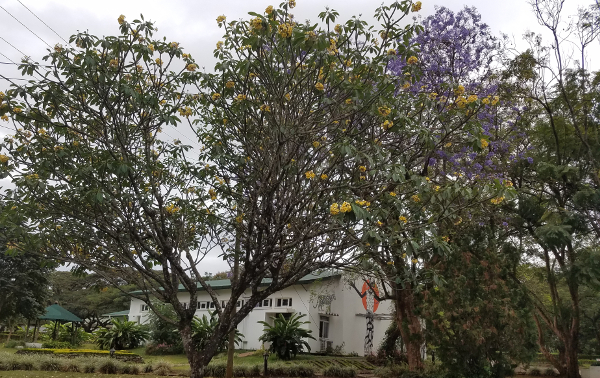 I must say, this is one of my favorite times of year in Moshi. The weather is not too hot yet and the normal greens are mixed with a riot of colorful trees and flowers. I hope as you move around campus you get a chance to look at some of the attractive sights around you. This week we have a few items of importance. The results of the MAP testing for students in P4 to M3 will be sent out via email to parents and you should have them in time for conferences. In the Primary, conferences are on Thursday, so there are no primary classes on that day. Primary students will be back in on Friday for class and the end of term assembly. They will be heading home about 10:15am. In the Secondary, conferences will be on Friday starting at 10:35am. We will be trying something different this year. Conferences will not be held in Karibu Hall, instead they will be in classrooms. This will provide a quieter, more private setting for these discussions. Sign up sheets will be displayed outside the rooms for parents to plan their time. For this to work well, we will need to stick to specific time blocks. We ask that, if you need more time you make arrangements to see the teacher at another time. Have a great last week before the break. Last weekend’s 24 Hour Run was, by all accounts, an unprecedented success. The event was, of course, about fundraising to create opportunities for low-income Tanzanian students to benefit from an ISM education. 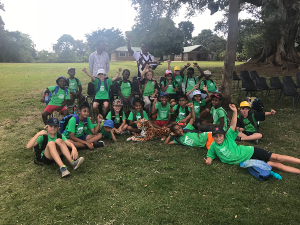 However, it was also about much more, not least raising collective awareness and connecting with the wider Moshi community. The occasion was indeed a genuine reflection of the very special community we are all lucky to be a part of here at ISM. The success of the event was a real collective effort with so, so many people pitching in to share ideas and responsibilities. Shared experiences such as this have an enormously positive impact on learning as well, empowering students to become aware and active contributors to the community. One of the underlying tenets of the IB is, after all, promoting the idea of students becoming active citizens, taking action to show understanding, to apply knowledge and skills, to reflect and, often, to make a contribution to a cause or stimulate positive change. If we genuinely want to empower our students to make a difference in the world, we need to help them personalise the action they take and understand that it is not just a mandate from teachers or parents but a life long mindset they develop. I have a sneaky suspicion that the 24 Hour Run will become an annual event going forward. Again, raising funds for for future scholarships at ISM was the projected aim of this wonderful event, but, hopefully, the impact on our students and our wider community will be long lasting and deeply felt. After the fantastic success of the inaugural 24 hour run we now look forward to International Day (26th October) and Hallowe’en (2nd November), the ISM fashion/talent show and of course our next major fundraising event, the KANGA GALA. As always, please remember that the PTA committee exists to act as a support network and a hub for our community. All parents and teachers are actually part of the PTA. All are welcome, and all are valued whatever part you can play. On Monday 1st October at 3pm in the EC class we will be having an open meeting to jointly plan how we can help to make this year’s International Day another day to remember and enjoy! We promise turning up does not mean you will be forced into anything you don’t want to do… everyone’s inputs are so gratefully received!! And sorry this comes so quickly after the incredible inaugural 24 hour run.. this next event is aligned with the United Nations International Day. Many thanks and see as many of you as possible on Monday at 3pm. The Friday following the break we will be celebrating two events, one is United Nations Day and the other is ISM’s 49th birthday. We will be doing this with our International Day assembly on Friday morning starting with the traditional parade of flags. Later in the day we will have events on the school grounds with booths from various countries. 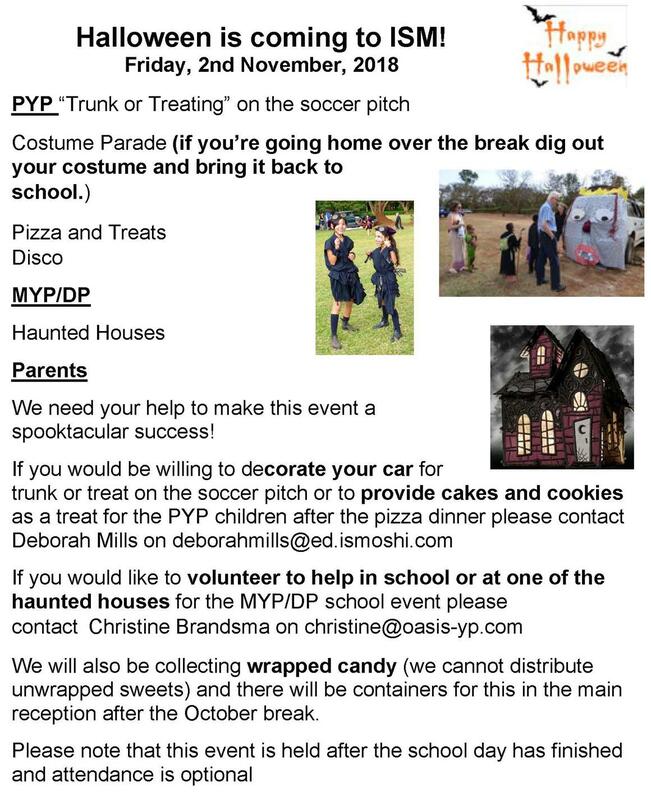 Please stay tuned for more information from the PTA. Students are encouraged to wear clothing from their home country, so you may want to plan for this over the break. We shall break from school on Friday 5th October and boarders are allowed to leave the same day. A few Diploma students will write SAT exams on Saturday 6th and then leave for home thereafter. Boarders will return to school on Sunday, 21st October for quarter 2. Thank you to those parents who have already sent us travel information, and if you have not, kindly share this with us so we are able to plan effectively. The school provides free transport to and from Kilimanjaro International Airport on the scheduled closing and opening days. On other days, the school will charge $60 one way to or from KIA. We are not able to provide transport to Arusha Airport. Last weekend was another busy weekend in the sports and activities for ISM. We had the fields continuously lapped by enthusiastic and motivated members of the community in the 24hr run. A special mention must go to Joshua for doing over 42 kilometres in the 24 hours, a huge feat for a 9-year-old. We also had our U19 boys’ and girls’ soccer teams competing in the second round of the NTAA. The girls chalked up a win and the boys have continued their unbeaten run, fingers crossed they can bring home the trophy this weekend in the last round of the tournament. 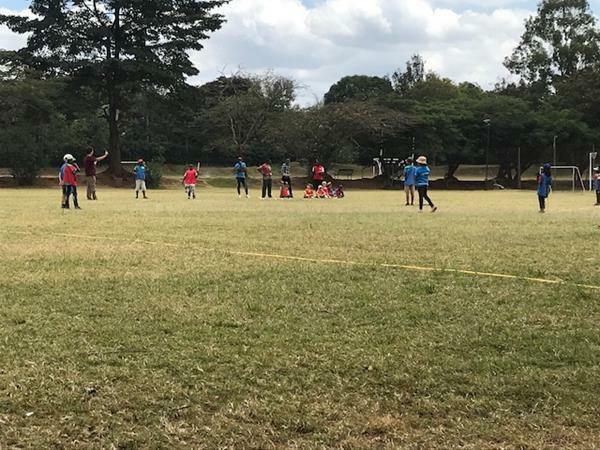 U13 boys’ and girls’ soccer teams started off their campaign in Braeburn International School, both team having one win and one loss. They will also be finishing off the tournaments this weekend at ISMAC. Our U11 and U9 rounders team had a fantastic tournament at Kennedy House on Tuesday. The U11s had a win and a narrow defeat and our U9s stole the show winning both games convincingly and have been crowned the U9 champions for this tournament. Well done to all athletes who have represented the school to date, I look forward to seeing much more success in the following year. First may I thank all parents for their support in various activities this quarter. We also welcome all of you to the closing Assembly and thereafter a conference on how our students are progressing in school next Friday starting at 10:35am. 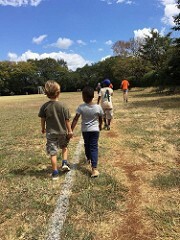 The M2 students went to Pangani for their educational trip and arrived back on Thursday. The trip involved all M2 students from both Moshi and Arusha campuses. Students learnt the economic and geographical features in Pangani. They engaged mathematically by applying scale drawing skills on the geographical features. They also graphed and interpreted the tidal patterns. This week the M5 students booked appointments and met their supervisors. Over the October Break, they will use the feedback to write their draft reports. They are encouraged to ensure their draft reports are ready as they report back from the break on October 22. The MAP tests are now concluded in the secondary school. Results will be communicated to parents and teachers as soon as they are processed. 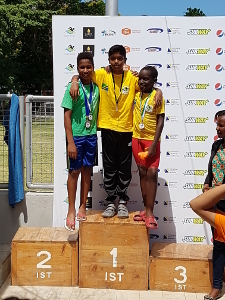 Last weekend Delhem and Sil of ISM Moshi were competing in the National Swimming Championships organized by the Tanzanian Swimming Association in Dar es Salaam. Both of them got PBs in every race they were swimming. Beside this good performance, Delhem won 1 golden medal in 100 IM, he got second place in 50 and 100 meter Backstroke, second in 50 Butterfly, second place in 50 and 100 freestyle and third place in 100 Butterfly. Delhem is very likely to represent Tanzania together with Maria in the CANA III swimming competition in Sudan coming November. This Monday, October 1st, we will have another set of university representatives visiting the school at 2:30pm. This will be a mix of schools from Canada, the UK and other locations. On Thursday reports for D2 students will be released. Please log on to ManageBac to access these. As well, remember that as a parent, you can log on and see what assignments are coming up and the marks from graded assignments. 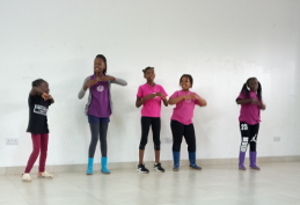 The final gathering left us in high spirits as we heard about spreading kindness from Mr. Ben and were entertained by the Zumba club led by Ms Zitha. The summative assessments went well across primary; I particularly enjoyed the P1/2 assessment. Most of the Primary students have should have brought home a letter showing the confirmed timings for the Goal Setting conference (except EC as some had left earlier than the rest of Primary). Important dates to note for next week. Tuesday October 2nd – End of Q1 Clubs – kindly pick your child from school at 1:05 p.m.
Friday October 5th – Final Assembly in K-Hall from 9 to 10:15 a.m. I appreciate all your support this quarter and wish all families a restful break. 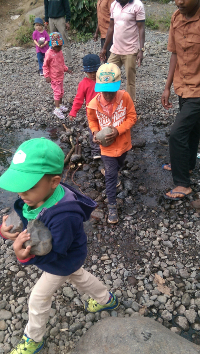 Here you see our intrepid explorers carrying rocks up from the river to our cars. We’ll use them for our upcoming project. How does it feel to be 10? What’s the best thing about being 10? What age would you like to be if you were free to choose? Our guests will then join us to paint their age and decorate a few of the rocks along our new garden pathway, chatting with the EC children about change and growth. We’ve already begun filming the journey and will combine stop motion, video and still photography in a short film- ‘Rock of Ages’. The premiere will be followed by individual presentations of learning from this first unit. Please attend our conferences next week. Bogglesworthworth the alien landed into our classroom this week. Its rocket ship crashed and it needed help fixing it. We had to prepare to teach it how to make friends and be a good friend in order to get people to help fix the spaceship. Speeches, songs, dances and drawings were made to present before Bogglesworthworth. What fun we had when it arrived into our classroom. Some of us were a little scared at first and we had to reveal who Bogglesworthworth was at the end. Thank you Mama Tiago and Madame Sonya for helping us with our summative assessment and being Bogglesworthworth on Wednesday and Friday. Copies of assessment sheets will come home next week. This coming week, we will only send reading books home on Monday. Please keep reading from the Epic reading site even over the break. I am looking forward to meeting you with your child on Thursday for our goal setting conferences. Show and Tell Friday morning: Free for anyone who wants to share. Our week got off to a fun start this week with the closed rounders tournament taking place on Monday afternoon. Thank you to parents who came out to support the players! This week P 2/3 have been working on their summative assessment. They have worked hard on making connections between what we have learnt over the past 5 weeks, and apply that to their summative assessment tasks. Students have thought about the importance of a balanced lifestyle, how to have a balanced lifestyle and what happens if you do not have a balanced lifestyle. We also looked at recipe books to see what healthy recipes we can find for our end of quarter healthy food party. An invite for this has been emailed, please take some time to fill it out before Monday. A quick reminder that goal setting meetings are on Thursday Oct 4th, and the last day of the quarter is on Friday October 5th. Please ensure all school books are back in school by Wednesday. 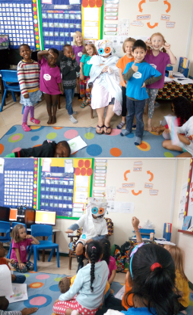 We would also like to welcome a new student in our classroom – Karibu Nuo La! The P4s worked well on their Summative Assessments this week and presented to their peers. In the coming week we will be setting goals for their conferences and these will be shared with the parents at home. We will also be selecting pieces for our portfolio and revising what we have learned this quarter. There will be no homework in the coming week however the P4s are encouraged to continue with daily reading and practising their multiplication. Kindly check that library books and any other school resources are returned to school by Tuesday 2nd Oct.
P4 parents, thank you for a smooth quarter and wish you all a restful break. The class did an awesome job presenting their projects about Rights, Rules and Responsibilities. They would like to invite parents into the classroom on Friday, October 5 to see the presentations and listen to our end of the unit projects. We will share our them from 8:00-9:00. Also, next Friday, we will have a book swap to encourage one another to read books over the October break. Please send in any chapter books that you no longer want, and that your child has already read. We will write recommendations and attach them to the inside cover. Quarter one went by fast, and your children did a great job with the first unit of the year. I look forward to more fun in class as the learning continues. Time flies when you are having fun, and I have a feeling with this great group the year is going to fly by! This week has seen the P6 students putting the finishing touches to their display boards about explorers. We are looking forward to sharing our work with you 8:00-9:00 AM on Wednesday in Karibu Hall. Next week we will have a mini literature unit on mystery stories. The children will read a variety of mystery texts (we have some great new titles for all reading levels) and we will discuss the features of the genre. The children will also start writing their own mystery stories and we will share these at a later date. I am looking forward to discussing your child’s progress with you at the 3 way conferences on Thursday. Please note that there will be no classes on that day. 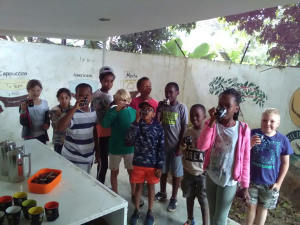 The photo shows the P6 students enjoying their coffee creations during our camp at Wild Tracks last week. Many thanks to Ms. Beaté for providing us with such an interesting and entertaining program of activities.